Had a fun dinner last night with runner Di and her husband Ron at Cafe des Artistes. They've travelled a lot and have lots of fun stories. I really enjoy Di's company. She and I ran again this morning, then met up twice more: at Bali Buddha mid-morning and at Tegal Sari in the early afternoon. (During our run Di spotted Wayan, the healer from Elizabeth Gilbert's book "Eat, Pray, Love", who she knows from previous visits to Ubud and who was also out running!) 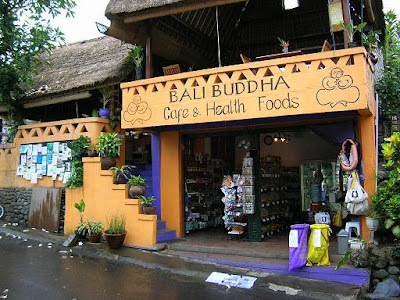 We spent time at Bali Buddha with Canadian Cat Wheeler, who is a really amazing woman-around-town and author of "Dragons in the Bath": a collection of her columns from the "Bali Advertiser" about her life (and issues) in Ubud. I've been reading this over the past week and loving it. Cat's involved in many projects aimed at helping local people become self-supporting, kids become readers, dogs become vaccinated and rabies-free, etc. I donated my security deposit on the villa, refunded by Sue, to Rotary to buy books for a mobile library for elementary schools. Good to talk with Sue over lunch. She's the incoming president of Rotary. People here all have amazing stories. I spent some time at Tegal Sari sorting rooms for when Therese and JB visit in December. I'll do something similar for when Jules and Yvonne visit in January. Worked for two hours on the terrace. Tomorrow I fly to Kuching, Malaysia, where I'll finish the job that has dominated my life for the past two months and start a new book for my Singapore client – my sixth (?) by this particular author! 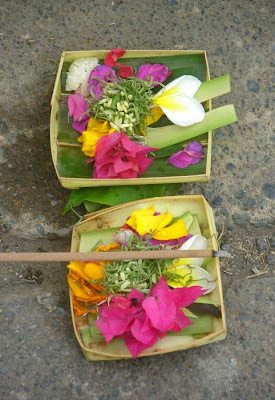 I've really enjoyed visiting Ubud and meeting some of the locals... A fascinating place! I successfully avoided being identified as a Bali HHH2 "virgin" and having to do a down-down (skolling a full glass of beer) last night after the 958th run of the Hash at Taman Mumbul, Sangeh. There was a crowd of about 70 or so expats and locals. I got a lift with Morgan (who I met the other day at his warung, Sanjay's) and David (a computer consultant). We arrived late. I tried to stay with David, who bolted off through the jungle, but I was wary of tripping over roots so I backed off. I ended up walking the whole course with Tara, a young mum and writer from LA, who had her 19-month-old son on her back (and later her front). After three days of rain, it was a really challenging course through rice paddies, along muddy levees, over gullies and irrigation ditches, and up and down steep, slippery slopes. At one point, by a channel where some local people were taking a bath, Tara slipped and fell forward on the rocks, on to the baby. He was very lucky not to hit his head. I thought her husband, who was up ahead, was a prick for not realising the conditions were dangerous and coming back to check on them. It was the least-fun hash run I've done, but it was good to meet Tara. I got a lift back to Ubud, after the very boozy, very boorish on-on, with two Aussies, Graham and Annie. They have spent decades living in Asia, including Hong Kong when I was there. Annie was at the International School and Graham was a professor of linguistics. Others in the crowd included a documentary filmmaker who had set the previous week's run, and the consul of a European country who had been awarded a high honour for his work following the first Bali bombing (2002). I really don't like the beer culture, but you do meet some interesting people! My run with Di yesterday morning was fabulous. We got on really well straight off. She's a graphic designer and has written a book on herbal horsekeeping. She did some horse work with Shane Gould, whose autobiography I edited. Her husband is a management consultant. They've invited me for dinner tonight at Cafe des Artistes. 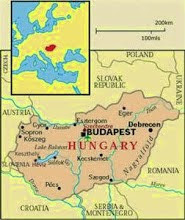 They have travelled widely in Europe and Asia. Amazingly, from my description, she recognised "Mr Chin" and his dog who I met while walking around and around Hanoi's Hoan Kiem lake! I took a motorcycle "taxi" back to my villa from Di's hotel, where we'd ended our run. I have a date to go for a run in an hour with my lift, Made. When I went to have breakfast at the warung just up the road a German woman, Amei, introduced herself. She travels five months a year and has done some amazing trips. She's off from here to head east through the island chain (Lombok, Flores, etc). She's a couch surfer, like my friend Ellen in Saigon, and is staying at Sue's place. She struck gold there! I told her about the salsa dancing at Cafe Havana and she was intrigued. I might see her there later today. She invited me to visit her just outside of Hamburg whenever I'm in Germany. I spent a couple of hours working on the terrace. After the hash run and lift back to town with Graham and Annie and their friend David I got a taxi to the villa, got the driver to wait while I washed off all the smelly mud, then went back to the main drag for a quick dinner at Bar Luna. 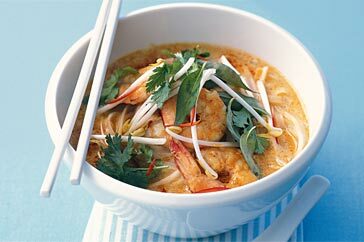 My belly was very happy with last night's dinner of green papaya salad with mandarin segments, and prawn laksa. I like to have a routine. This morning I ran out along my road, Jalan Sri Wedari, for 20 minutes or so. We're on a ridge with drops on either side, but as the road winds up the hill it flattens out a bit. 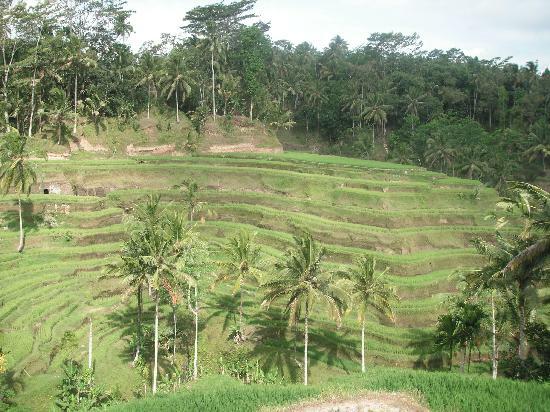 There are temples and these rice terraces at Tegallantang, lots of street dogs, and plenty of people and kids to say "Mornin!" to. This was my first run here, but I'm hoping to have another one tomorrow with a woman I chatted with yesterday morning. My new routine is to have breakfast of fresh juice and kopi, and sometimes savoury rice, at the warung three doors up. It's sort of like the Coffee Mamma van scene in Albury, complete with low plastic stools but without the lycra. Last night I spent time with some of Ubud's literati at Bar Roma, at a literary event honouring bad-boy poet Arthur Rimbaud. There were poetry readings, a birth chart reading, performances and a couple of songs. Mention was made of the New York punk scene of the 1970s, so I felt right at home in my Chelsea Hotel T-shirt. My main priority during this week in Ubud is to try and finish a job. I've not had much luck organising a volcano climb through various contacts, and the weather's not being very cooperative. (It's been raining for two days.) Tomorrow I'm meeting up again with the bloke who coordinates the Hash House Harriers. I spoke with Morgan and his wife Krista at their cafe out near the Bintang Supermarket the other day. I haven't had a chance yet to see much art, though I spent a few minutes today in a small gallery that had contemporary work by a young gun whose work seems to be mostly about getting drunk. I worked into the early afternoon at the table on the terrace of the kitchen/dining pavilion, which is separate from the villa's living quarters. Discovered Warung Makan, a few doors up, which is sort of like the Coffee Mamma van for locals. I'll try it for breakfast tomorrow. Went shopping for a few groceries, and for chocolates and wine to take tonight to my landlady Sue's "American Idol" pot-luck supper. 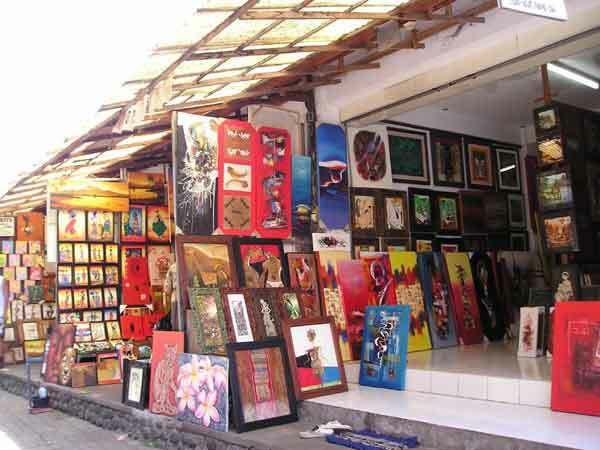 Her villa is a couple of doors up, next to the warung. I bought a book by local author Cat Wheeler, who I've been given an introduction to by friends from Oz. I'm now going to spend an hour reading it on the terrace overlooking the rice terraces, before it gets too dark. It's lovely seeing these traditional flower offerings scattered around the garden of the villa. A long day yesterday spent flying here from Sydney, during which I worked for three hours, followed by a 90-minute drive up to Ubud. I immediately had to start work on the monthly newsletter that subsidises my lifestyle. Today was also spent on that, and on getting my bearings around town. Something was very active in the rafters last night, which I found quite disturbing. Talked with Sue W, who I'm renting the villa from, briefly last night and again this morning. Martyn and Joanne came up from Melbourne for my going-away party and weekend. A send-off by them, Therese, Mum, Deb and Steve, and Col and Tracey, at the airport. Lovely brunch out at Burrumbuttock at Di and Brendon's on Saturday. Thanks, everyone, for the well wishes. Stay safe yourselves. My home away from home in Sydney these days is Australia Street Guest House (www.australiastreetguesthouse.com.au) run by photographer Anne Zahalka and her film producer husband Ian Collie. Last night Anne gave my old friend Chris M and me an artist's talk on her new series, "Homeground! ", which is being exhibited outside and in three pubs in Newtown. The works are contemporary, multicultural reinterpretations of the classic old pub posters of the 1930s to 1970s. My friend Rick appears in two of them. They look wonderful. We had drinks, and a huge antipasto platter courtesy of the hotel, at the Union Hotel, where the exhibition opened. This older work by Anne is called "The Bathers". On a recent visit to Vietnam, I attended early morning mass in Ho Chi Minh City’s Notre Dame Cathedral. I hadn’t risen at 5 a.m. with the intention of seeking forgiveness for my sins (I’m a lapsed Presbyterian), or even of admiring the interior of this landmark building constructed by the French colonialists. In fact, I had set out from my hotel in the opposite direction along Dong Khoi Street, intending to run alongside the Saigon River. But even at that very early hour, I was simply too much of a chicken to attempt to cross the road. I took the easier option and retraced my steps. The traffic in both Saigon and Hanoi, in the north, is horrendous. Although there are traffic lights, they provide pedestrians with only a tiny window of opportunity to commence crossing the street before they are borne down upon by a phalanx of mainly motorbikes, but increasingly also cars, vans and buses. Here’s how to do it: When you get a walk sign, start walking … and don’t stop. You won’t have the road to yourself, but motorcyclists and drivers will make their way around you if they can see that you are moving forward in a predictable fashion. If there are no traffic lights, watch for a momentary easing up of the flow of traffic and then start walking. (Be mindful that cars and buses aren’t as manoeuvrable as bikes.) Once you step into the flow, don’t hesitate, or turn back, or start to run; be watchful and take evasive action if necessary, but basically keep moving steadily forward. After a couple of days I started to enjoy the adrenaline rush. I even found it quite addictive. I have a good friend who is very active in the Saigon Hash House Harriers (www.saigonhash.com), but I was in town at the wrong time of week to run with them. I’ll save that for my next visit. While in Ho Chi Minh City I spent two days trying to be of help at the Christina Noble Children’s Foundation (www.cncf.org). The Centre was started in 1989 by Irishwoman Christina Noble. (I read her books "Bridge Across my Sorrows" and "Mama Tina" many years ago.) Twenty years later, CNCF has changed the lives of countless street and destitute children, both in Vietnam and Mongolia. I donate my time to edit the newsletter for the Australian arm of the organisation (www.cncf.org/en/news/view.php?id=1310), and I sponsor a teenage girl in Mongolia, so I wanted to see for myself how it all worked. I was shown the ropes by three volunteers who were each spending three months working at the Centre. We assisted with feeding, brushing teeth, and playing with babies, toddlers and young children with disabilities ranging from blindness and spina bifida to dwarfism and cerebral palsy. I felt quite useless, but I did what I could. Inevitably, my heart went out to a couple of the children whose faces I can still summon up at will. CNCF does an amazing job, but it’s dependent on donations. A great way to assist the Foundation in its work is to fundraise for them while participating in cycling challenges, sponsored walks, and the like. If you’re interested, see the newsletter for some upcoming Charity Challenges. 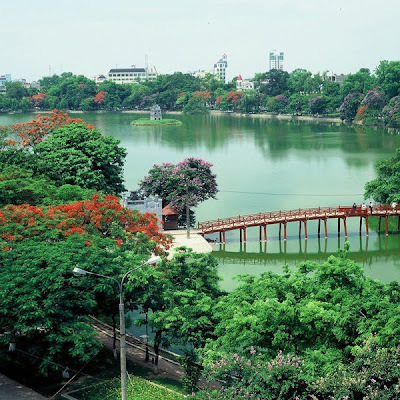 Like Ho Chi Minh City, Hanoi is built on a river, but for me its most charming feature was Hoan Kiem Lake, very near the old city. When I visited Hanoi I had just run a half marathon in Hong Kong, so I was content to take early morning walks around the lake after first negotiating the half-dozen road crossings that lay between my hotel and its shores. I’m a fast walker, and it didn’t take me long to walk a full circuit of the lake. I quickly found that the fun lay in checking out how the people who used the lake for their daily exercise regimen kept changing every half-hour or so. The earliest users congregated on the steps of department stores and near other areas where loudspeakers that had once broadcast Communist directives now blared disco music as a background for mainly women performing vigorous arm and leg exercises. On my second circuit of the lake those women would have disappeared, to be replaced a little further along by couples playing badminton. Next circuit, the muscle boys with their weights would have made an appearance. Always, there were walkers and runners. Two men I saw on my first circuit on my first day at the lake caught my attention. The slightly chubby, cheerful-looking man of Chinese appearance who ran alongside his little dog, I christened ‘Mr Chin’. The thin, grey-bearded Vietnamese man who race-walked, I dubbed ‘Uncle Ho’, after Ho Chi Minh, whose embalmed body I had seen lying in state the day before. We each greeted the other, with a nod of the head or a lifting of the hand, during our second and third circuits of the lake. On my second day I hoped to see them again, and was pleased when they appeared. Again, we greeted each other whenever our paths crossed. On my final day, I was tickled pink when, on schedule, I again saw ‘Mr Chin’ and ‘Uncle Ho’. During each circuit our greetings became more and more effusive, until on my final go-round I veered towards them and shook their hands. We patted each other on the back, and smiled sheepishly at the pleasure our encounters had given us over three days – all without having exchanged a word. 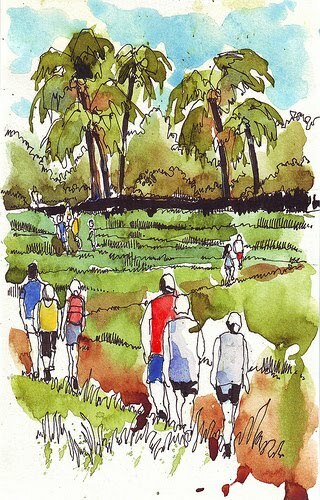 That afternoon I joined the Hanoi Hash (www.hanoih3.com) for a run in a rural area north of the city through rice paddy fields, small villages and a lightly forested area where the North Vietnamese Army had once trained to fight their adversaries in what is known in Vietnam as "the American War". 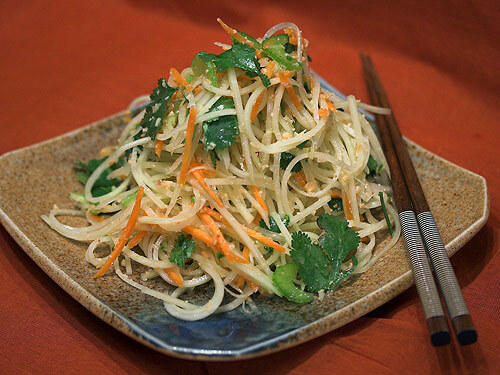 DON’T MISS: Breakfast of pho (beef noodle broth) at a roadside stall; drinks at the Caravelle or Rex hotels in Saigon; purchasing a beautifully executed copy of a favourite painting. My last four races have all been in different countries. I ran the Melbourne half marathon in October, the Angkor Wat half in Cambodia in December, half a half marathon in New York City on 25 April, and the Rotorua marathon in New Zealand on 1 May. I don’t train in order to race; I enter races so that I’ll do the training. I’m the sort of person who needs to set goals. Without them, I’m all over the shop. Setting racing goals gets me out there for early morning runs with my pals, and it’s those runs that I find necessary for my physical, mental and emotional health. If I’m not running, I’m not my best self. I find running is also a fantastic way to meet people when I’m travelling. When I visit a new place, I will often seek out a local running club or the Hash House Harriers for running company. I’ve even been chatted up while on the run. In Cambodia, I met a Canadian bloke when I was running along Phnom Penh’s Sap River. We ended up making a date for a run together the next morning, which turned into dinner that night. The following morning I flew up to Siem Reap for the half marathon, which skirts the edges of the 12th-century ruins of Angkor Wat. The course was lined in places with hordes of young children, whose outstretched hands we touched as we ran past. It’s the only race I’ve participated in where the spectators have included monkeys. I spent time at the start and during the race talking with a Swedish tour guide from Ho Chi Minh City, a Scottish woman who works with a law firm in Dubai, an American who is with the World Bank in Bangkok (she and I ran about half the race together until I started to fade at around 16K), and a Danish woman who was setting up a factory in Hanoi. On Pub Street that night, I sat with my feet in a tank of fish and had a fish massage while chatting with a woman who works in Hong Kong with the art auction house Christie’s. The Phnom Penh Hash House Harriers (P2H3) meet on Sunday afternoons for runs in various locations (www.p2h3.com). 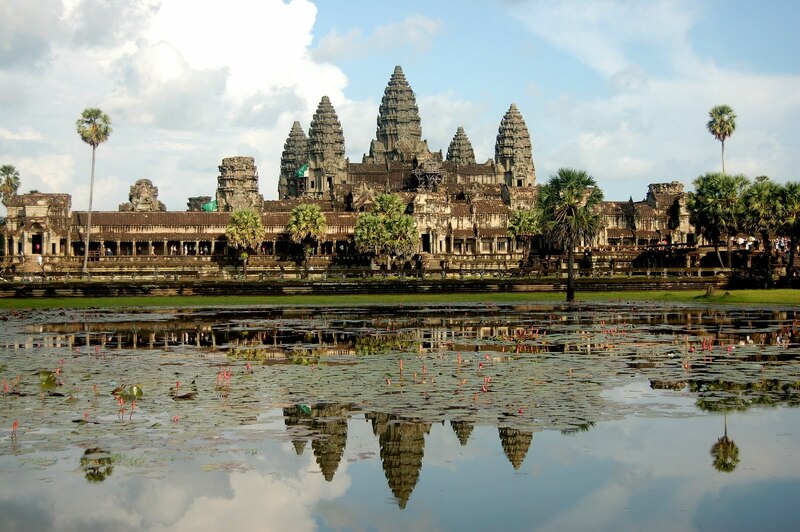 There is also an Angkor Wat Hash (www.hannostamm.com/hash.htm). A couple of weeks ago I flew to New York to run the More half marathon with my friend Kathy and her friend Jodi. Kathy and I are friends through an online running network. Last year, when I was passing through San Francisco, she and her family took me to dinner at the fabulous Cliff House. On the day of the race it was raining and freezing cold. I had no goals for this event, which I had always intended to run just for fun. By the end of Jodi’s and my first circuit of Central Park, I was chilled to the bone and decided to bail. I had too much on my plate over the next month, to risk getting sick. Jodi and Kathy persevered despite the grim conditions and finished. Six days later I was lining up at the start of the Rotorua marathon, in New Zealand. It was only my second attempt to run 42.2 kilometres. I’ll be doing it twice more this year: in Portland, Oregon, in October and in New York in November. I spotted a bloke wearing a Portland marathon T-shirt, so I introduced myself. Mark was on holiday in New Zealand from the US, and was competing in races wherever he found them during his travels. Three days later, he popped up two rows ahead of us on our flight from Auckland to Sydney. And today my American friend Nangel, who I will meet for the first time later this year in Portland, told me she ran a long training run there yesterday and got chatting with a bloke named Mark who had just returned from running a marathon in Rotorua, New Zealand… When she said a friend of hers from Australia had also run it, he put two and two together. It’s certainly a small world when you’re a runner! My friends Di and Rose from Albury were also at the starting line in Rotorua. Four and a half hours later, I staggered across the finish line, happy to have beaten my Honolulu marathon time by 5 minutes. The next day, Di and I ironed out the kinks by taking an hour’s walk with my dad and a friend through Rotorua’s stunning redwood forest (www.redwoods.co.nz). A good long soak in the hot mineral baths at the Polynesian Spa (www.polynesianspa.co.nz) also helped soothe our aches. Visitors to Rotorua can join in runs hosted by Lake City Athletic Club (www.lakecity.co.nz). DON’T MISS: In Cambodia: Fish massage; green papaya salad; pre-dawn exercisers on Sisowath Quay; Genocide Museum and the Killing Fields. 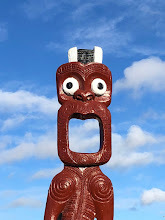 In Rotorua: Hokey pokey ice cream; a forest walk; lunch at Fat Dog Café. A few days after this column appears I’ll be setting out on my adventure. First stop: Ubud, in Bali for a week; then Kuching, in Sarawak, for a month. A big ‘thank you and mwa’ to Julie, Dinky Di, Frangipani, Rosie, Christine, Miss Vicki, Roberta, the Vixens, and my trainer Jules for sharing your runs and bad jokes with me. In October 2008 I flew into Lukla, a tiny village airstrip high in the Himalayan foothills, just 10 days after a similar Twin Otter crashed and exploded on landing there, killing all 16 trekkers on board (among them, two Australians) and their Nepalese group leaders. I’ll admit to taking half a Xanax with my breakfast coffee that morning at the Kathmandu Guesthouse before our group headed for the airport. Our destination was Everest Base Camp, a week’s very challenging walk away. I was fairly confident I could complete the trek. In fact, I’d tacked on a three-week circuit of the Annapurna ranges for afters. But fate had other plans. It’s possible to walk these high trails independently of an organised group. You can hire guides and porters in Nepal’s capital, Kathmandu, or in Lukla, Phakding or Namche Bazaar. I trekked with a group organised by the Australian company Intrepid Travel (www.intrepidtravel.com), which included three guides and a half-dozen or so porters. Our accommodation was in traditional tea-houses. Between Lukla and Namche Bazaar, where I spent my 56th birthday, the trails are heavily trafficked. Local Nepalese villagers, sherpas, porters, trekkers and traders make their way up and down the steep stony paths, carrying goods in large bamboo baskets on their backs or on the backs of small Tibetan ponies, cows or yaks. In this first part of the trek, we crossed a number of suspension bridges spanning the milky-green rivers. It’s alpine scenery with a Buddhist bent. I loved the sounds of the trail: the different animal bells, the flapping of prayer flags strung from inconceivable places, the clickety-clicking of prayer wheels, the steady chipping of axe against stone, the sound of rushing water. Namche Bazaar, at 3443 metres, appears to cling precariously to the steep slopes at its rear. Our group stayed two nights there, to acclimatise before heading higher into the mountains. On our free day we walked up to 3880 metres, visiting on the way Khumjung sherpa village, home to many of the sherpas who have climbed Everest. Back in Namche I celebrated my birthday with a little retail therapy, a massage before dinner, and a whisky. The jewel in the crown of Sagarmatha National Park is Mt Everest, but I fell in love with Ama Dablam, which seems to guard the approach to the higher parts of the trail. On our second acclimatisation day, a two-day walk from Base Camp, about five of us made it to the top of Nagarjan Hill, near Denboche. It was the hardest walking I’ve ever done, over stony, very steep terrain at high altitude (5000 metres). I sat on a boulder on the summit eating a chocolate-covered caramel, while tears rolled down my cheeks. It had been bloody hard work to haul myself up to this place near the roof of the world, but the views from my rocky perch were incredible. I added my small stone to the mound left by others, and began my descent. Halfway down, my feet slipped out from under me and I fell backwards, landing heavily on my left wrist. When I tried to get to my feet, I felt faint. ‘That’s not good,’ I thought. I ended up at the Himalayan Rescue clinic in Pheriche, luckily just an hour’s walk from Denboche. Here, the volunteer doctor diagnosed a possible Colles fracture of my left wrist. He put my arm in a splint, and advised me to return to Kathmandu for x-rays and possible surgery. It was incredibly hard for me to accept that I couldn’t go on; in fact, I was a bit of a sook about it. The next morning I set off with a guide and a porter to return to Lukla. We would need to cover in two days what had taken us four days to walk on the way into the mountains. Back in Kathmandu, I had consultations with an orthopaedic surgeon at a local clinic. (It was here that I also met one of the organisers of the Everest marathon and half marathon.) Two days later I had surgery at a Kathmandu hospital to insert two pins in my wrist. Four or five days later I was back in Australia. While fate may have given my attempt to reach Everest Base Camp the finger, it gave a big thumb’s up to another of my plans. An unexpected insurance payout arising from my broken wrist was just enough to pay for my flights to New York a few months later. Visitors to Nepal are spoiled for choice when it comes to organised treks. Peregrine (www.peregrineadventures.com) and Exodus (www.exodus.co.uk) are two other companies I’ve had experience of who lead Everest Base Camp treks. However, I was happy with Intrepid, and particularly with their local operator, and will probably choose them again when I return to Nepal to pick up where I left off. DON’T MISS: Kathmandu’s famed Rum Doodle restaurant, the haunt of serious mountaineers; bartering for semi-precious stones in the markets of Namche Bazaar; Ama Dablam.